I could have started this series about guitarists by featuring a fast heavy metal guitar slinger (and believe me, I love them) but instead I have decided to scrutinize the style and tone of The Cure‘s Guitarist: Robert Smith. We will also see how we can reproduce his tone using some common pedals. The Cure formed in 1976 as “the Easy Cure” to be renamed “The Cure” two years later. Characterized by a dark sound and gloomy lyrics, it was at the forefront of a movement labeled as new wave alongside acts such as Joy Division. 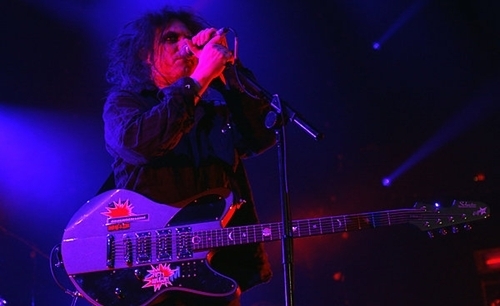 The Cure is still in activity today and released an album (4:13) in 2008. Although the line up has changed constantly through the years, guitarist/singer Robert Smith has been a constant in the band (alongside bass player Simon Gallup) and the main writer/composer. Look here for a complete biography of the band. As a guitarist, Robert Smith is very much into creating atmospheres using various modulation effects as well as delay. Starting with the disintegration album released in 1989, the Fender Bass VI, a baritone guitar, became an essential part of his sound and he is one of the rare users of the instrument in the realm of rock. But I will focus here on an album which, to me, defined The Cure sound: Seventeen Seconds released in 1980. In particular, this album features ‘A Forest’. This song was so influential in the 80s that I remember it being the very first song I ever played in a band (I was playing the keyboards at the time and was shockingly bad at it). The production of ‘A Forest’ is explained in details in the December 04 edition of Sound on Sound Magazine. What is particularly interesting in this article is the fact that the base of the guitar sound was a Fender Jazzmaster plugged into a Roland JC-120 whose built-in stereo chorus and clean tone was captured using two microphones. On top of that, a lot of outboard effects (flanger, delays and reverb) were used to create that very atmospheric sound. At the beginning of the song, the guitar sound is fairly dry, only some modulation is present and towards the end more delay is introduced. There are plenty of versions of this song on youtube and you’ll notice that in the more recent versions, the guitar tone is even more modulated and that quite some delay is added. A Boss BF-2 Flanger (now replaced by the BF-3 but easy to find on the second hand market). The settings were manual 60%, Depth 75%, Rate 50% and Res 25%. A Boss DD-3 Delay: all knobs more or less at 50%. A Boss RV-3 Reverb (discontinued too and replaced by the RV-5): balance 25%, tone 30%, r.time 40%, mode 10. Of course, other brands than BOSS are fine to emulate Robert Smith’s tone as long as you have a good chorus or flanger (a flanger is preferable but a strong chorus can do the trick) but the man himself uses a BF-2 (he actually has been using the whole Boss modulation/delay collection over the years). In these examples, I use a Fender Custom Shop American Classic Fender Stratocaster from 1997. It is equipped with noiseless Kinman pickups (the av-n blues set) and plugged into a Marshall JMP-1 preamp set clean (channel “clean 1”, gain 9) and plugged straight into the recorder, a Boss MICRO-BR. The drums are provided by the drumbox built in the recorder. Woo! This is great! I just got a 1982 Japan-made BF-2 from ebay for 40GBP precisely to obtain this kind of vibe, and I was only ten minutes ago trying to work out what settings Robert used. You are great. Sorry there aren’t any other comments – it’s like you wrote this just for me. The Fender Bass VI is actually a 30″ short-scale six-string bass NOT at all a baritone guitar. It is tuned one octave below that of a standard guitar tuning (EADGBE.) Typical string gauges run from .095 to .025. Baritone guitars – on the other hand – are usually tuned a perfect fifth lower (A D G C E A), a perfect fourth lower (B E A D F♯ B), or a major third lower (C F B♭ E♭ G C). And they use lighter gauge strings than this. They also are 28″ or so scale. finally some useful bf 2 settings. thanks a lot. Thank you. I have also written a post dedicated to the BF-2 with more settings shown in a video. I always tried to figure out how they got that swirly sound. I get something similar with an analog flanger and chorus with slight delay, but Robert’s playing often sounds more lush. I realized his attack on the strings is a bit subtler. His wide range of guitars also has a huge influence. He started using a lot of Fenders, then gradually moved to Gibsons and warmer sounding guitars. Hi everyone, first of all, really great work!, i just want to know how to get the effect on Homesick at 1:39, for me it seems to be a flanger with a metalic sound, but i’m not sure; if someone knows it please tell me I’ll really appreciate it.